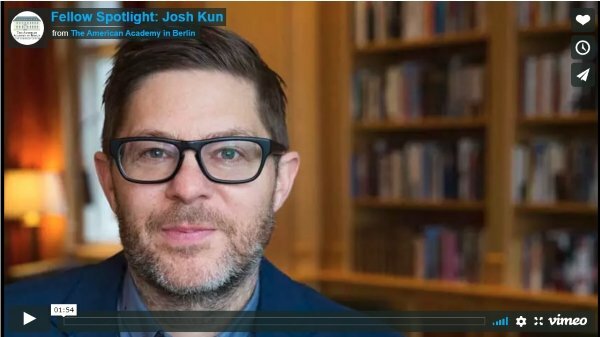 Josh Kun is a writer, curator and professor in the Annenberg School for Communication and Journalism and the Department of American Studies and Ethnicity at USC. Josh’s work focuses on the music and politics of cultural connection, and he is the author of 2005’s Audiotopia: Music, Race, and America, which won a 2006 American Book Award, and co-author (with Roger Bennett) of And You Shall Know Us By The Trail Of Our Vinyl: The Jewish Past As Told Through The Records We Have Loved and Lost. His other books include The Tide Was Always High: The Music of Latin America in Los Angeles, To Live and Dine in L.A.: Menus and the Making of the Modern City, (with Van Dyke Parks) Songs in the Key of Los Angeles, and (with George Rodriguez) Double Vision: The Photography of George Rodriguez, the first career retrospective of legendary photographer and activist, George Rodriguez. Since the 1950s, Rodriguez quietly documented multiple social worlds—in California and beyond—that have never before been displayed together, a rare mix of Hollywood and Chicano L.A., film premieres and farmworker strikes, album covers and street scenes, celebrity portraits and civil rights marches. Kun spent spring 2018 semester at the American Academy in Berlin studying the effect of immigration on music in Europe. Josh is co-editor (with Ron Radano) of the book series Refiguring American Music for Duke University Press and his writing has appeared in numerous books and scholarly journals, as well as in The New York Times, The Los Angeles Times, LA Weekly, and many other publications. He co-curated (with Bob Santelli) the 2012 Grammy Museum exhibition on Los Angeles music 1945-1980 as part of the Pacific Standard Time series, and co-curated (with Jim Heimann) The Donkey Show at The Santa Monica Museum of Art. Josh is also a member of The Idelsohn Society for Musical Preservation, a non-profit reissue label and digital archive dedicated to Jewish-American music, with whom he has co-curated the museum exhibitions Jews on Vinyl and Black Sabbath. He serves on the editorial boards of American Quarterly, Boom: A Journal of California, The Los Angeles Review of Books, and The International Journal of Communication.